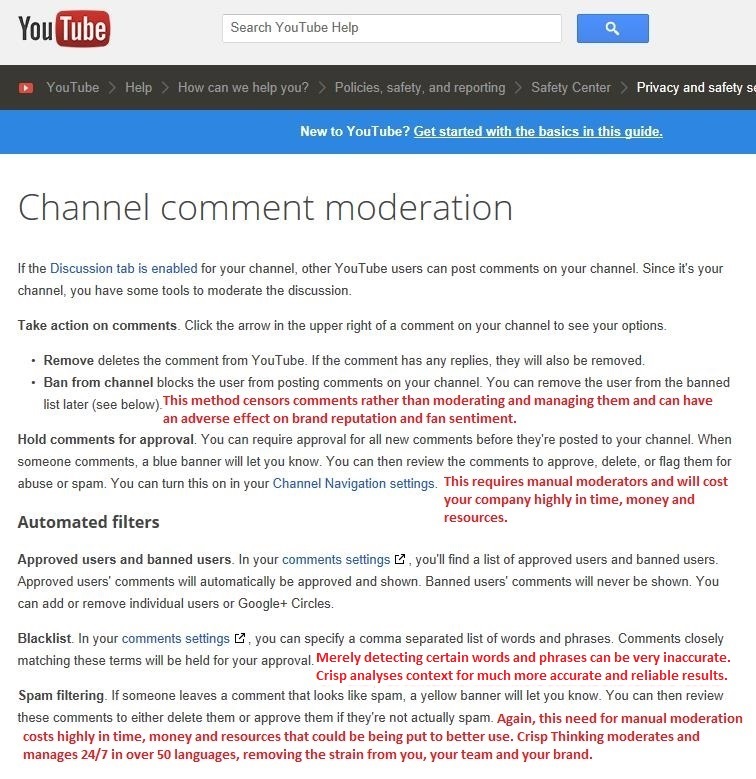 YouTube has rolled out its latest moderation tools – and it’s good to see the site is making an effort to protect users and brand channels. However, despite creating the impression that it’s our spam-fighting knight in shining comment moderation armour, I can’t help but feel these developments are somewhat lacking when it comes to providing comprehensive protection for brands and their fans. Brands can only access these moderation tools if they link their channel to a Google+ account (maybe a bit of a sneaky move to get Google+ more users). I’ve read comments relating to this topic claiming that YouTube should be commended, complimented and even praised for this new introduction, but despite its best efforts, YouTube is no moderation expert. The fact is that these new moderation tools just don't provide the extensive service of a moderation company. With YouTube’s moderation facilities, brands are still responsible for moderating their pages – which means time and money will still need to be spent sifting through user generated content 24 hours a day. Unfortunately, YouTube’s method of moderation isn’t scalable either – so as your brand becomes increasingly popular, receives more comments, and attracts more spam; the more manual moderators, time and money you will need and your brand will find itself trapped in an uncomfortable catch-22 situation. Sadly this approach to social media moderation won’t properly protect your brand – it could even have the effect of a security blanket; making companies feel protected when they could actually be just as vulnerable as they ever were. Social media management and content moderation company Crisp Thinking has years of experience in developing state-of-the-art technology that provides comprehensive and reliable brand protection, 24/7 without the added cost to your time, money and resources. Crisp’s user generated content moderation can be easily scaled too, allowing you to enjoy the growth of your brand without worrying about any added strain. So hats off to YouTube for making a stand against abusive users, spammers and trolls, but please don’t believe this is the answer to all of your online moderation dreams – it’s not (and if you think it is, you could be in for a rather rude awakening).